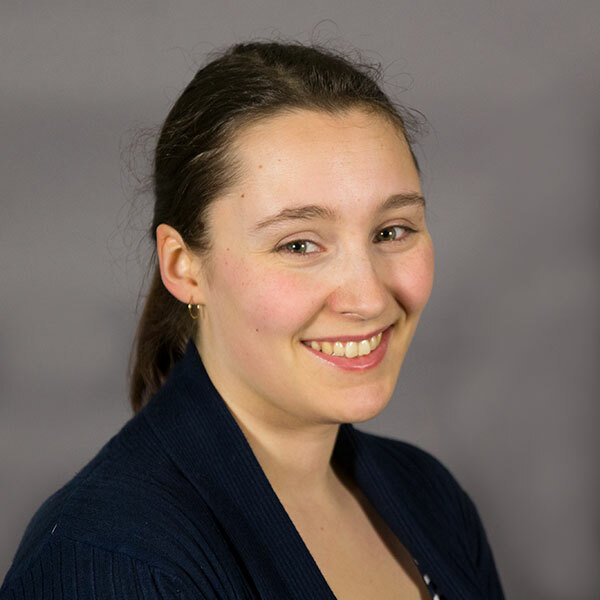 Emma Langan is exploring the life underpinning our global ecosystems: the tiny, green lungs of the earth - phytoplankton such as coccolithophores. What effects will climate change have on these organisms, especially in the warming waters of the Antarctic? Equipped with an Oxford Nanopore MinION, and the Leggett group's latest algorithms for analysing the DNA sequencing data produced in real time, Emma - a PhD student in the Leggett Group here at EI and the Mock Group at the University of East Anglia (UEA) - set off on a six week expedition with the British Antarctic Survey aboard the RRS Discovery “krill cruise” to the Southern Ocean to find out! Hi Emma! What took you to the South Pole? 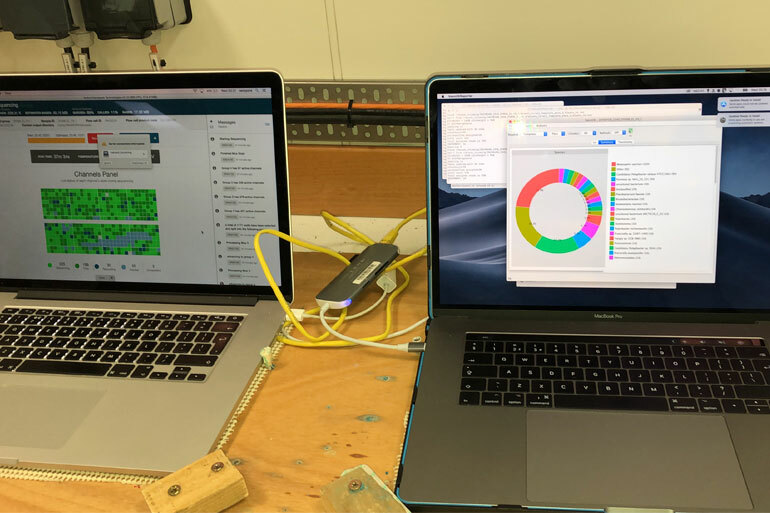 I went on the cruise to test out the Nanopore MinION DNA sequencing machine and NanoOK RT analysis software to see whether we could use it for sequencing polar algae while onboard a ship, rather than waiting until the samples are sent home. 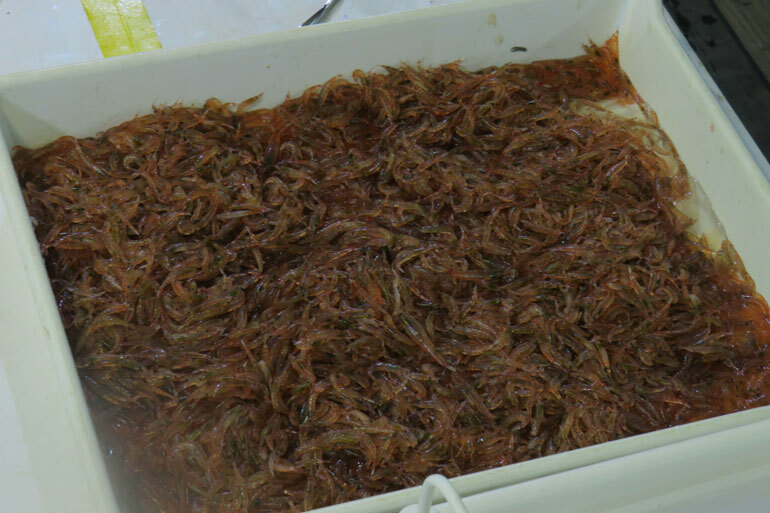 At the moment, samples are collected onboard the ship and preserved, for example by freezing, and stored until the ship returns to the UK, often months later and then they can be analysed. For example, I collected samples in early January which I won’t be able to work with until June. This causes problems because a lot of polar algae don’t grow well in culture, and freezing can reduce DNA quality, so we don’t know whether we are getting the full picture. Some species of algae have more fragile DNA than others, so we might also be introducing bias towards species with stronger DNA. 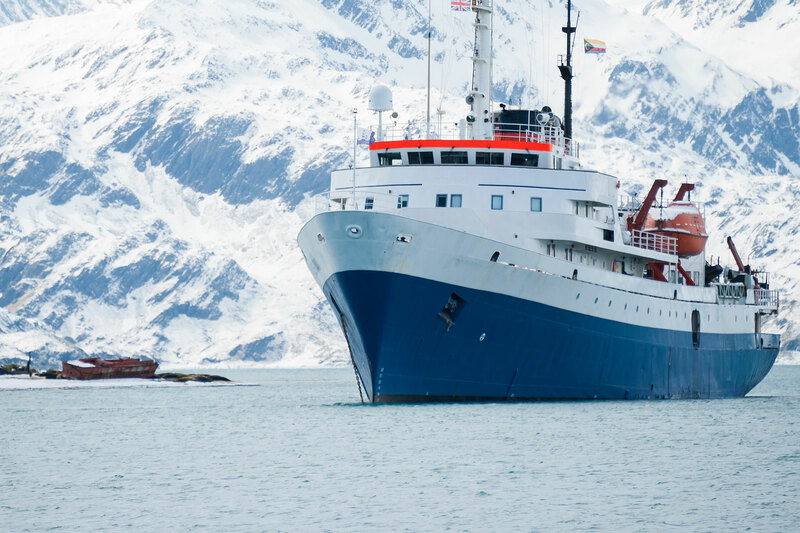 Real-time sequencing onboard research ships would help scientists to make decisions about where and when to sample. If you can have sequencing data within a few hours of sampling indicating which species are present, then you can make evidence-based decisions on what to do next. If you have found something interesting you might decide to stop and sample more from that location, if you have enough of something you can move on. 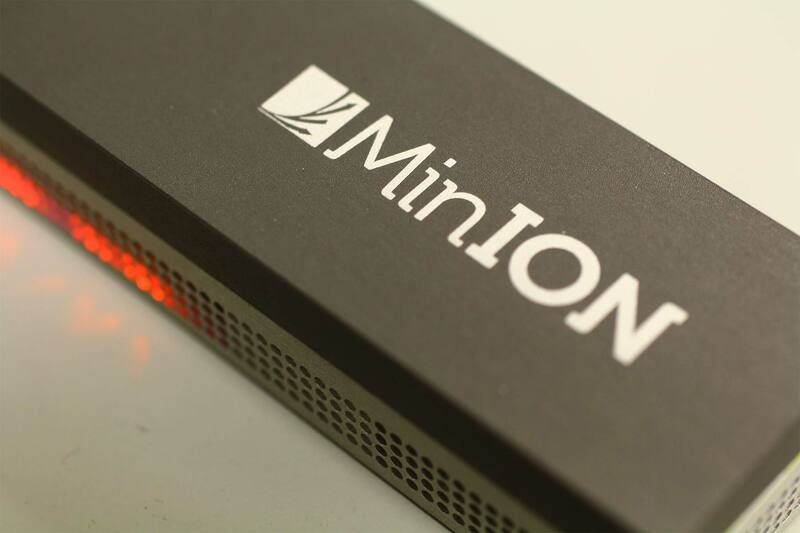 My project was a proof-of-concept, no one has ever used the MinION for real-time DNA sequencing in the Southern Ocean before so we wanted to test whether it would work. 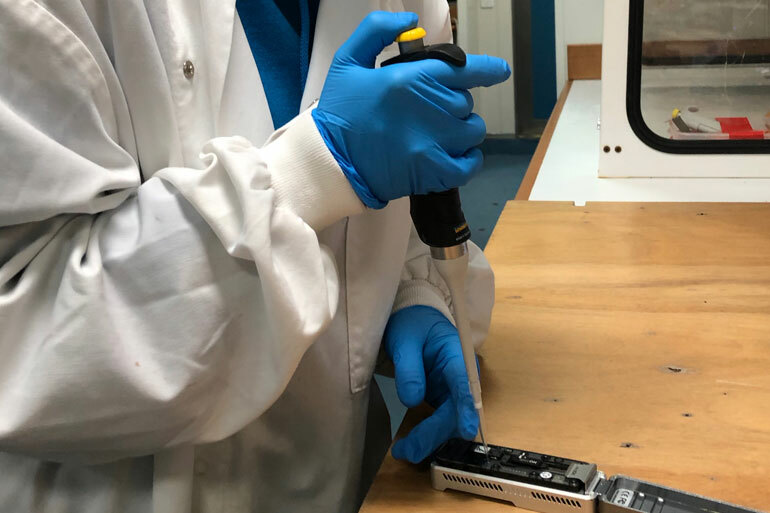 Real-time sequencing onboard research ships would help scientists to make decisions about where and when to sample. If you can have sequencing data within a few hours of sampling indicating which species are present, then you can make evidence-based decisions on what to do next. 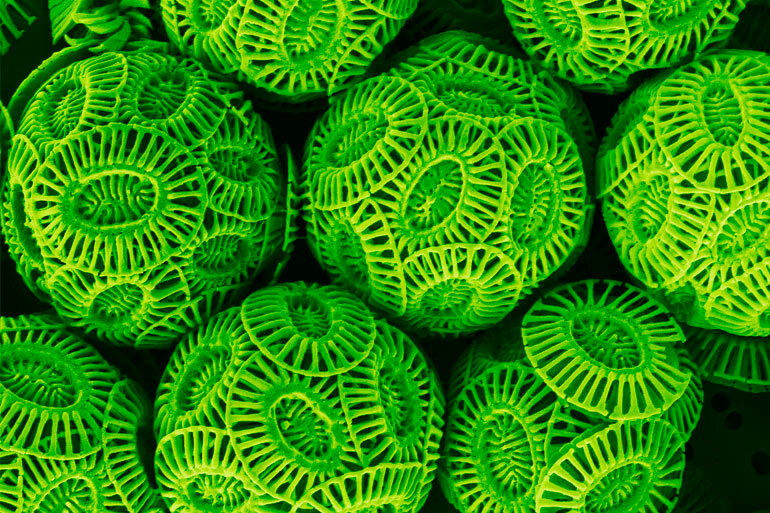 Why is it important that we study organisms such as coccolithophores? Phytoplankton, including diatoms and coccolithophores are responsible for biogeochemical cycles of important nutrients such as nitrogen, iron and silica, and carry out primary production, producing a significant proportion of the earth’s oxygen. Diatoms have glass-like cases (silica frustules) and coccolithophores have calcium armour plating (calcium carbonate coccoliths) and these organisms are also heavily involved in the carbon cycle. The carbon cycle is important in climate change, as increased carbon dioxide causes warming and ocean acidification. 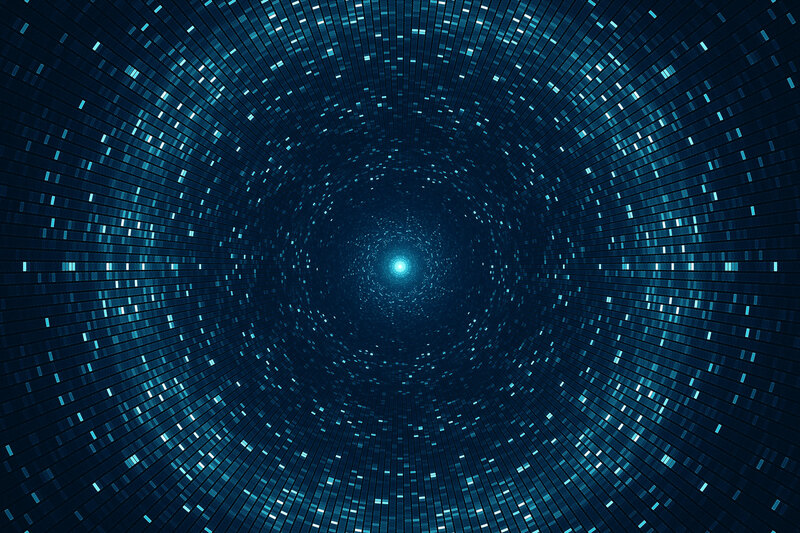 Heavy organisms like diatoms and coccolithophores sink on death and carry the carbon in their cells to the sea floor, removing it from the carbon cycle. This helps to reduce the progress of climate change. A coccolithophore is a unicellular, eukaryotic phytoplankton. Phytoplankton are also the basis of the ocean food web. They make energy from the sun and are preyed upon by zooplankton which in turn are eaten by fish and other sea animals. In polar ecosystems, phytoplankton are particularly important as all of the animals rely on them because there are no plants, so polar bears, seals, penguins and humans are all fuelled by phytoplankton. Climate change is likely to have an effect on phytoplankton, with those which live at the poles likely to be the most affected. We are interested in studying polar diatoms which have specific adaptations to live in very cold climates (psychrophilia) and coccolithophores to understand the methods they use to survive and how they might adapt to changing climate. What’s life like on a big ship? There were 49 of us onboard, 25 crew and 24 scientists. The ship had lots of lab spaces, a bar (one unit of alcohol allowed per day, beer, wine and cider only), a tv room, the mess (canteen), and a gym. The chefs cooked 3 hot meals a day for everyone, with vegetarian and vegan options too. Sometimes it was easy to forget you were on a ship, until the waves picked up! Everything has to be secured if you don’t want to find it on the floor, including your cup of tea, laptop, and lunch! There were non-slip mats on the tables in the mess and you could tell the weather was bad when there were water bottles instead of water jugs on the tables. When we arrived on the ship, one of the first things we did was set up the lab equipment, ensuring that it was all tied, bungee-corded, taped and wedged into place. Improvised cup holders appeared rapidly on the desks once we started moving. Even then, a particularly big roll did cause some of the lab equipment to set off to the other side of the room, along with all the chairs and anything not tied down. Sometimes it was easy to forget you were on a ship, until the waves picked up! Everything has to be secured if you don’t want to find it on the floor, including your cup of tea, laptop and lunch! There was always a lot going on. 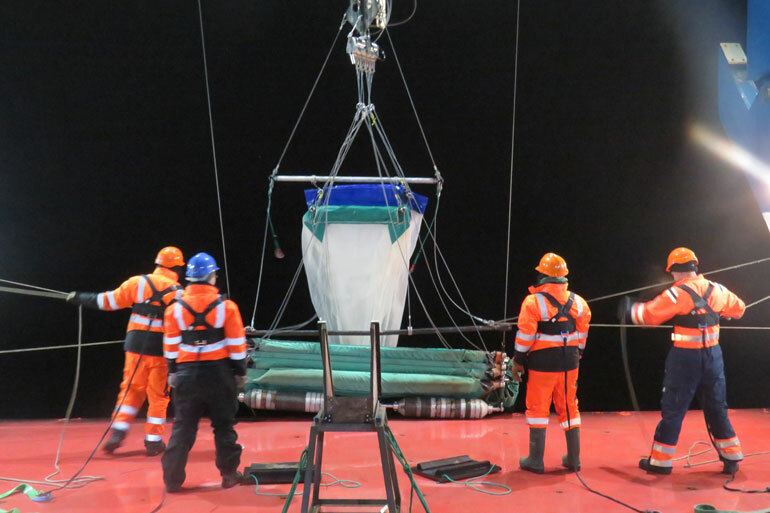 Each day when the weather was good enough there were nets deployed to sample krill and other zooplankton, this was mainly done at night because zooplankton move up through the water column when it gets dark. There were other side projects as well, for example microplastic sampling and pteropod sampling, which had different nets to be deployed. When the nets came in there was a lot of work to do to sort the catch into the different species to record the quantities. This data is used to track changes in populations, as the same sampling is performed each year in the same specific areas. My work was mainly using the CTD (conductivity, temperature, and depth) rosette, which is a huge circular contraption with bottles attached that can be opened at different depths. The CTD measures conductivity, temperature, and depth, as well as taking water samples at the chosen depths. 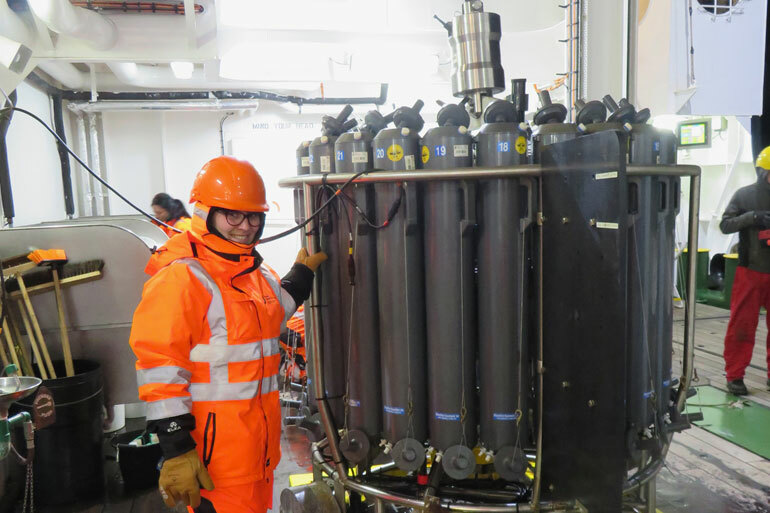 I collected samples at the chlorophyll maxima, where there is the most phytoplankton – usually around 50m deep. Other people used CTD samples for investigation of salinity or other environmental conditions. The CTD was deployed twice a day, taking up to 6 hours to travel down as far as 3000 m to collect samples and come back up. My work was mainly using the CTD rosette, which is a huge circular contraption with bottles attached that can be opened at different depths. The CTD measures conductivity, temperature, and depth, as well as taking water samples at the chosen depths. Once I had the water from the CTD, it had to be filtered. I did this in the cold room which was set at 2 ℃ to keep the conditions as similar as possible to the ocean and prevent phytoplankton reacting to changes. For each sample, I collected around 100 litres of water which had to be filtered, taking up to 10 hours. Over the course of the cruise I collected over 1000 litres, or 1 ton, of sea water. Once the water was filtered, I froze some of the filter at -80 ℃ and used the rest for DNA sequencing. For DNA sequencing I did chemical phenol-chloroform DNA extraction and put the resulting DNA into the MinION which ran on a laptop. Using another laptop, I was able to run NanoOK RT software which allowed me to see what species I had sampled in real time. That was really exciting, as we were able to see what was present in a sample that been collected just a few hours before and see whether we had the species we were expecting. Other people on the ship had different projects, there was a group of whale watchers who stood up on the top deck surveying the whales and other to monitor population changes in the Southern Ocean. It was always interesting to go and join them for a bit, and I got to see a lot of different wildlife including blue whales, humpback whales and albatross, and several species of penguin, although it quickly got very cold up there! Blue whale swimming around the ship. Gentoo penguins swimming, waiting for the nets to come in! Spotting Icebergs near Bristol Island (South Sandwich Islands). Icebergs with tunnels inside, near Bristol Island. We set off from Cambridge on the 27th of December and arrived in the Falkland Islands (Islas Malvinas) three days later. 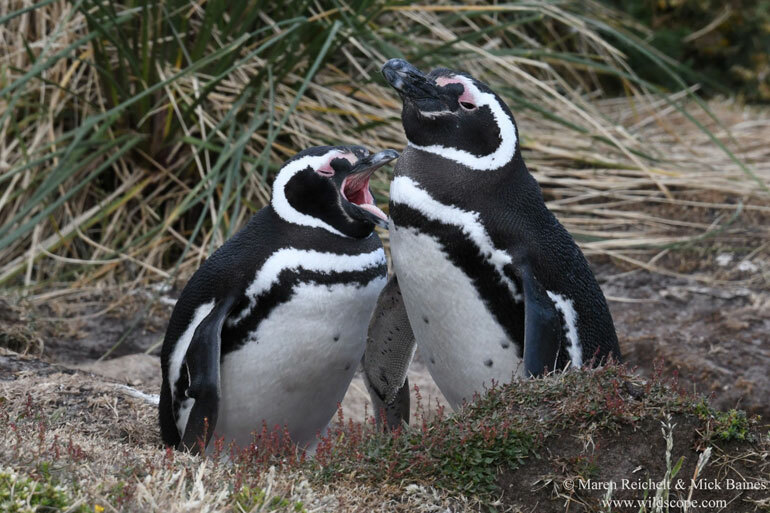 The route is not direct, taking us via Sao Paulo, Santiago, and Punta Arenas. We started to set things up onboard the ship on the 31st of December, before heading into Port Stanley to ring in the new year and visit the penguin colony at Gypsy Cove. We set off on the 2nd of January and were at sea for 6 weeks, until the 12th of February. 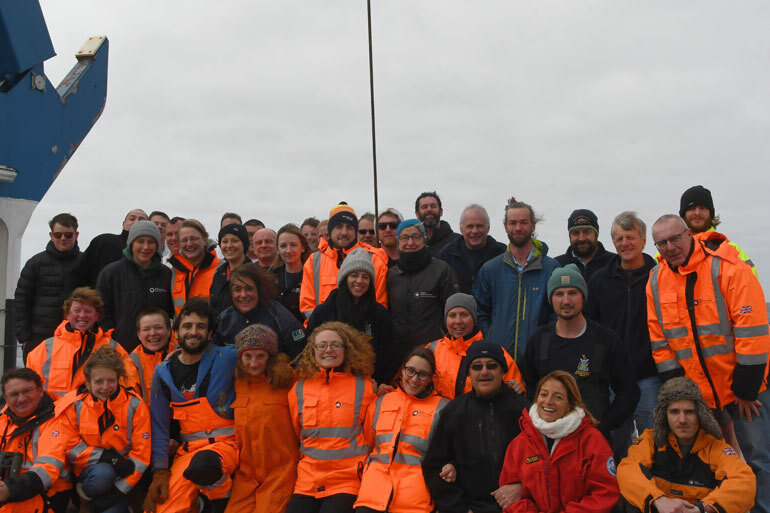 Our route was from the Falklands to South Georgia and the South Sandwich Islands and back again, but we were surveying the krill population and so we had to do several transects in specific areas so there was a lot of going backwards and forwards and generally going round in circles. 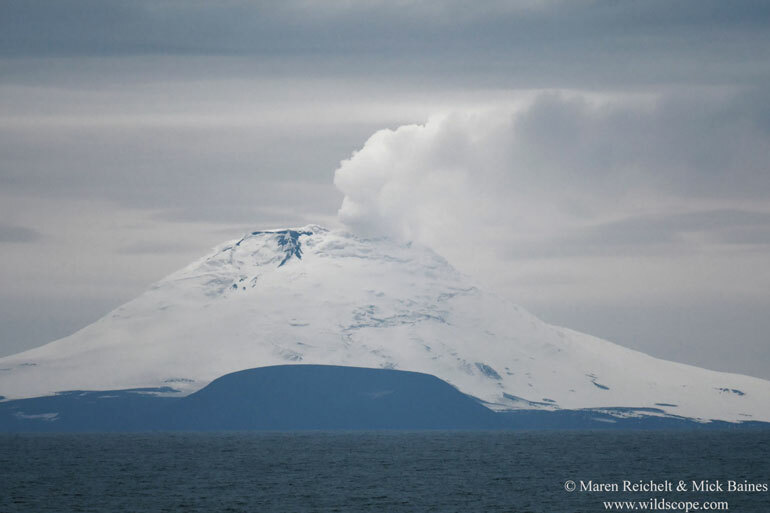 We stopped at South Georgia and were able to land and explore the island, more on that later, and we also went close enough to see some of the South Sandwich Islands which are completely uninhabited, including Saunders island - an active volcano which was erupting as we passed. Did you have any hiccups en-route? With long distance travel there’s always bound to be problems! Our flight from Santiago to the Falklands was cancelled and we had a bonus day exploring there. It was 30°C and beautiful, we climbed the Cerro San Cristobal, visited the Cerro Santa Lucia park, and walked along the Paseo Bandera urban artwork. It was a great opportunity to explore a wonderful city. We visited a bar and discovered terremotos – wine, grenadine, and pineapple ice cream - which were very very sweet and absolutely deadly (the literal translation is 'earthquake'). 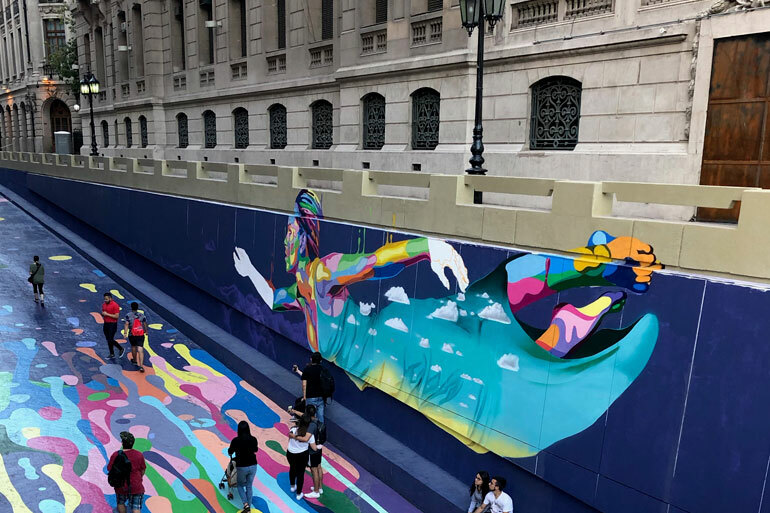 Emma unexpectedly spent an extra day on Santiago, so she went exploring which included a walk along the Paseo Bandera urban artwork. On the ship, one minor technical hitch we encountered was the 24-mile iceberg in our intended path which we had to re-route to avoid. First things first, I discovered that nothing ever goes entirely to plan on fieldwork and that improvisation is key! For example when our filtration system which arrived last minute didn’t work the way we expected and we had to come up with a way to get it working using only what we had on the ship. I also discovered that even when it doesn’t seem very cold outside, wind chill and being on a moving ship mean you need to wrap up warm. Finally, I learned that however much you may know that blue whales are the largest animals to ever live, and that wandering albatross are the largest birds in existence, it still doesn’t prepare you for the sheer enormity of them in real life. 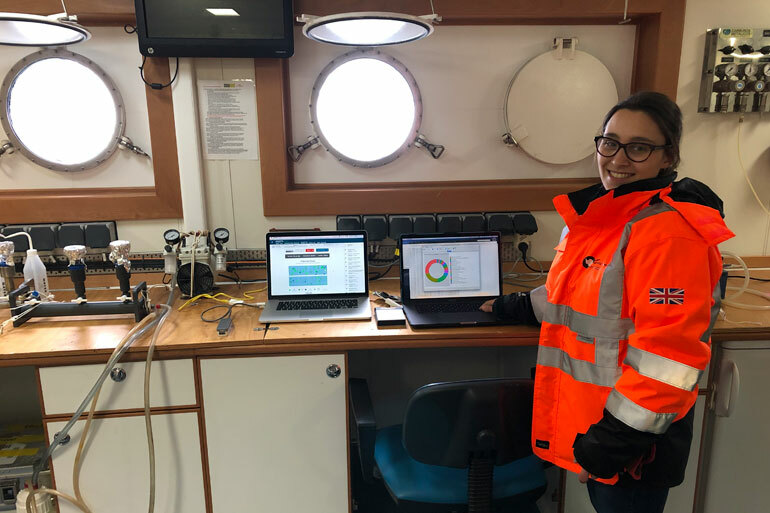 Scientifically, I found that it is possible to perform real-time MinION sequencing while on a ship in the middle of the Southern Ocean and to see what species are present. We were able to match our predictions based on sight and smell to the species found in the sequencing data which was really exciting, and we collected a lot of data that we can use to see whether there have been any changes in population distribution. 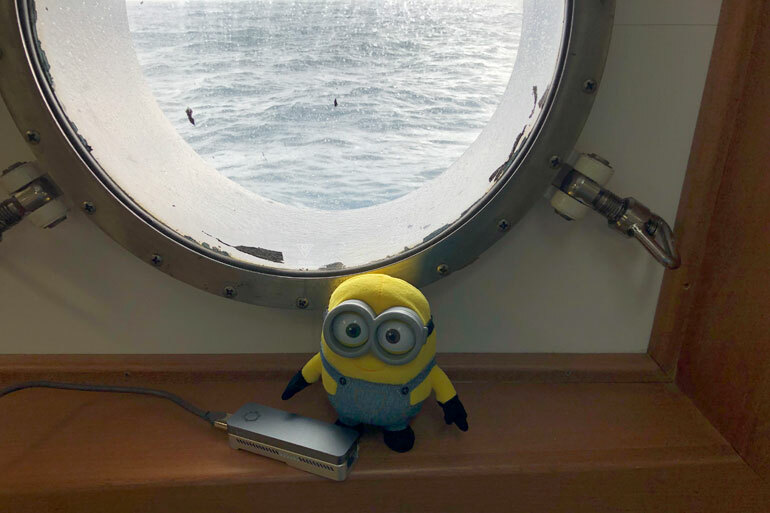 A Nanopore MinION DNA sequencer with the "other" minion, enjoying the view from Emma's cabin! It’s not all about work - what else did you get to see and do while on the krill cruise? About halfway through the cruise we landed on South Georgia. We were able to explore Grytviken, an abandoned Norwegian whaling village, which was last inhabited in the 1960s. There’s a museum there, and it was fascinating to see how people lived and worked in such a remote place, with next to no outside contact. There is a King Penguin colony on South Georgia which we got to see, when we were there a lot of the penguins were moulting which makes them grumpy because they can’t swim or feed. Some very smug ones had already moulted and were showing off which can’t have been helping! There are also a huge number of fur and elephant seals there. The elephant seals are enormous, weighing up to 3 tons, they’re very smelly and they like to lie in piles on top of one another. The fur seals are smaller, much more mobile, and inclined to chase after you threateningly, fortunately the ones that chased us were small and not too scary – I wouldn’t like to be chased by one of the fully grown bulls! While we were off the coast of South Georgia, there was also a spectacular lenticular cloud formation one evening, as a result of katabatic winds across the Southern Ocean hitting the South Georgia mountains. Antarctic fur seal with pup, South Georgia. Elephant seals basking, South Georgia. King Penguins moulting, South Georgia. Waves crashing against an Iceberg at Bristol Island. Lenticular cloud formations, South Georgia. Apart from that we kept ourselves entertained with a range of activities, we had a couple of pub quizzes in the bar which were great fun – unusually, one included a round on rats. A few of the scientists set up a circuits session that ran most days, and there were some other activities including wheelbarrow races which were perhaps inadvisable on a moving ship! There’s a cinema room with lots DVDs so we watched quite a few films, including a couple involving sinking ships which may not have been the wisest decision – fortunately we didn’t hit any icebergs. The bar also had a dartboard which was well-used, there was some consternation when we arrived at a bar on land and we were unable to play properly because we had got used to compensating for the movement of the ship. What’s next, now you’re back on dry land? Now I’m back, I’m enjoying seeing grass and trees, and eating fresh fruit and vegetables which had become decidedly scarce by the end of the cruise! In the office, I’m analysing all my data that I collected on the cruise and deciding what we’ll look at in more detail. I’m also working on improvements to my protocols for a future cruise. I’m aiming to do a second cruise where we will try to answer specific questions based on what we have found, now that we’ve proven the basic concept can be successful in the field. Once my samples arrive with the RRS Discovery when it docks in Southampton in June, we’ll also do comparisons with other methods using samples that are still on the ship, which will tell us how successful the MinION sequencing was. Images featured within this article used with kind permission of Alejandro Ariza, Maren Reichelt, Mick Baines and Emma Langan, from their recent Antarctica research trip aboard RRS Discovery.